The proposed Hyperloop Hotel would use shipping containers turned into hotel rooms to carry guests between more than a dozen U.S. cities via a Hyperloop transit system. A new design concept that aims to combine the luxury of a hotel room with a high-speed rail system could make traveling between U.S. cities faster and far more comfortable. The mobile "Hyperloop Hotel" idea was recently announced as the student winner of the 2017 Radical Innovation Award, a competition for new ideas in hospitality. The Hyperloop Hotel is the vision of Brandan Siebrecht, a graduate architecture student at the University of Nevada, Las Vegas (UNLV). Though the Hyperloop — a transportation system in which passenger-filled pods are accelerated through low-pressure tubes to their destination — is still in the development phases by several companies, Siebrecht thinks it is the next big innovation in transportation. "I wanted to explore ways in which this technology could transform the overall travel experience and branch into hospitality," Siebrecht told Live Science. "Guests can travel to any hotel destination within the network and even visit multiple destinations in a single day." 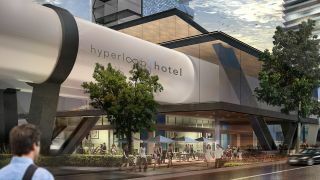 Rather than passenger-carrying pods like train cars, the Hyperloop Hotel would use repurposed shipping containers as suites that travel through a Hyperloop network. At each destination city, the suites could dock at a modular hotel. The whole concept relies on modular design, ranging from the suites themselves to hotel towers made up of suites and permanent amenities, according to Siebrecht. The design relies on a Hyperloop transportation network that could accommodate the container suites. Siebrecht said the construction costs for the hotels would vary, but he estimated that they would cost between $8 million and $10 million. If the Hyperloop Hotel comes to fruition, Siebrecht said, it would cost passengers about $1,200 per trip, including travel and a one-night stay. "This is an average cost estimate, meaning travel to nearby destinations could cost less than this number and travel to cities farther apart could cost a bit more," Siebrecht said. "In its beginning stages, this experience is marketed to the business elite. Hopefully, in the future, cost for this technology will lower to accommodate the average traveler." Siebrecht's initial proposal includes 13 travel destinations in the U.S.: Austin, Texas; Boston; Chicago; Denver; Las Vegas; Los Angeles; Nashville, Tennessee; New York; Portland, Oregon; San Francisco; Santa Fe, New Mexico; Seattle; and Washington, D.C. However, Siebrecht said the network could expand to more destinations in the U.S., as well as link cities in Europe or Asia. By winning the student award in this year's Radical Innovation competition, Siebrecht received a cash prize and scholarship opportunity at UNLV. His Hyperloop Hotel concept will also be highlighted during an event in October, which is held to select the competition's professional winner from three finalists.